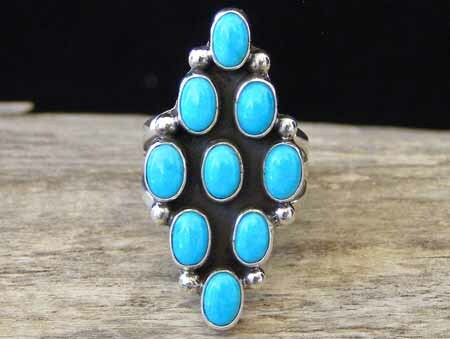 This ring by Navajo silversmith Linda Yazzie has a diamond-shaped face set with nine calibrated ovals of natural, untreated Sleeping Beauty turquoise from Arizona. The shank splits into three narrower bands before attaching to the ring back. The Sleeping Beauty Mine is no longer producing turquoise and the price of this classic Arizona turquoise continues to rise as the stone becomes increasingly difficult to find. Hallmarked Y and stamped Sterling inside the shank. Stones: 9 ovals 1/4" x 3/16"
Ring face: 1 1/2" x 5/8"